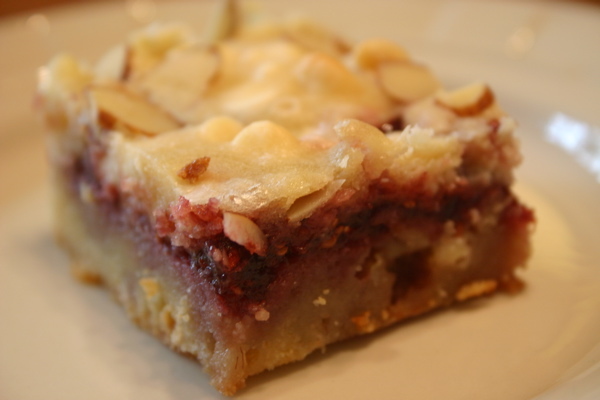 Raspberry Bliss Bars are one of my “go-to” recipes when looking for something that is different from the everyday, but still very easy to prepare. 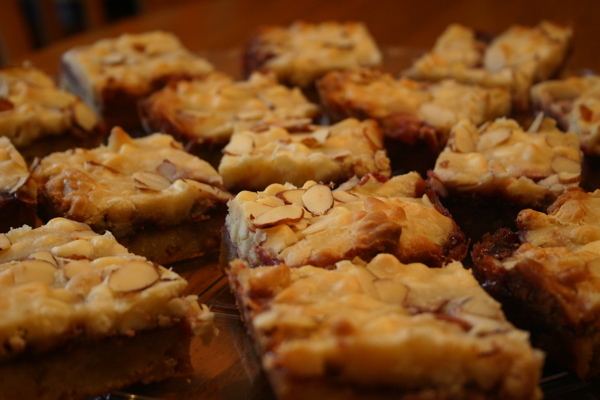 These bars are one of my most requested deserts when I cater lunches. They are just that good. Everyone loves them. So if you are looking for something a little different for your cookie exchange this year, you owe it to yourself to try these babies. You will not be disappointed, unless you take them to the exchange and then have none left for yourself. I think they are just about perfect paired with a nice strong cup of coffee. You will love the richness the white chocolate brings and raspberry jam gives it just the right amount of tartness to contrast the sweetness of the white chocolate. I prefer to make mine with jam with seeds, but feel free to substitute seedless if you prefer. So to help you get a boost onto your cookie baking this season I am giving away 2 sets of baking spices from Penzy’s Spices. If you have not had Penzy’s spices, you are missing out. They are amazing! First, please leave a comment on this post telling me your favorite cookie for the holidays. Second, you can enter by subscribing to the Dinah’s Dishes updates by email. After you have subscribed, add a comment that indicates you have done so. Third, share this post by Facebook or Twitter and then add a comment indicating you shared it. Preheat oven to 325 degrees. Grease and flour a 9-inch square pan. Melt butter in a 2-cup measuring cup. Add 1 cup white chocolate chips and let stand for 5 minutes. DO NOT STIR! Beat eggs in large bowl until foamy. Add sugar; beat until it is a light lemon color (about 5 minutes). Stir butter mixture into the sugar mixture. 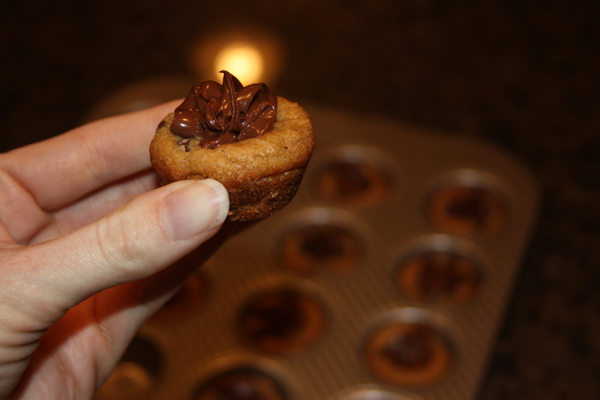 Add flour, salt, and almond extract; mix on low speed until combined. 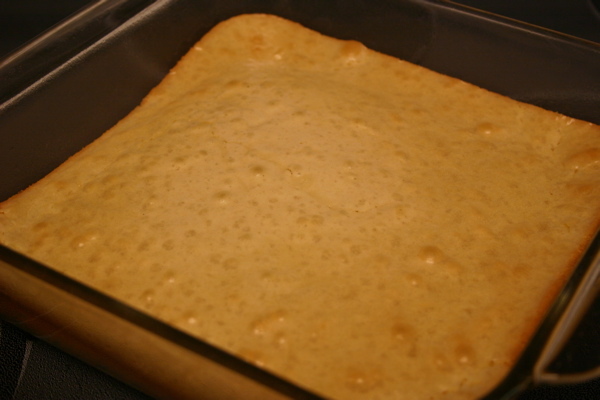 Spread 2/3 of batter into prepared pan. Bake for 15-17 minutes or until light golden brown around the edges. Heat jam for 30 seconds in the microwave; stir. 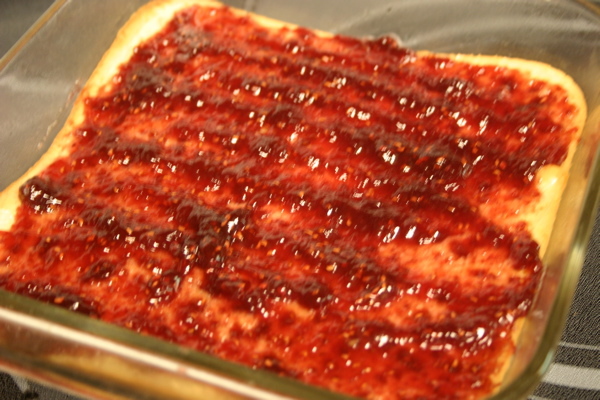 Spread jam over warm crust. Stir remaining white chocolate chips into remaining batter. Drop spoonfuls of batter over jam. Sprinkle with almonds. Bake for 25-30 minutes. Let cool completely before serving. The bottom layer just out of the oven. Raspberry jam spread over the crust. 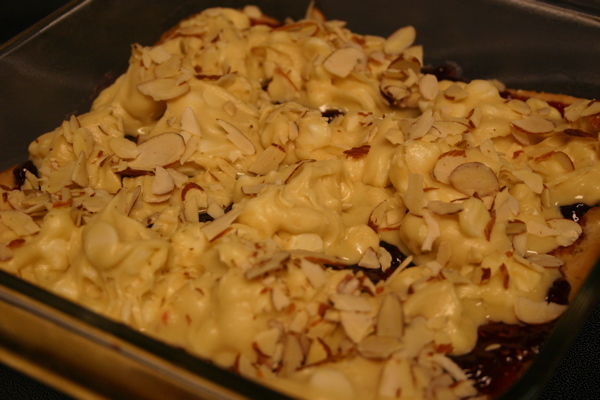 Remaining batter dropped by spoonfuls on top and sprinkled with almonds. 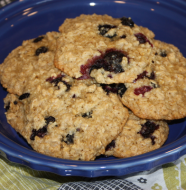 50 Comments on "Raspberry Bliss Bars and a Giveaway"
My favorite Christmas cookie is a spritz cookie. I seem to search every year for the best recipe and always try several types – still searching for the best. But I love pressing the designs out with my cookie press and trying different shapes. I subscribed via email to your blog! I love your recipes and stories! My favorite holiday cookies are my mom’s norwegian cookies- we call them San Cacas… not sure how to really spell it, but they are buttery and almondy. We make them in old family tins that are shaped like flowers and hearts. I already follow you in my blog reader, but I now subscribed by email too. I just shared on fb. Great, these will be great for the Holidays…. My favorite holdiay cookie is a pecan bar that I cut from a Christmas magazine years ago. Of course, the snickerdoodle is my all time favorite, if that counts! I love these! I was just thinking about them yesterday. They are on my list. I am a Trevecca grad. I graduated in 99. Glad you enjoy the blog. We make a norwegian cookie as well but ours are in small tart like pans. We love to put thickened raspberry sauce in them and top with whipped cream. love spritz cookies. It is fun using the cookie press. My favorite Christmas cookies are old fashioned sugar cookies. They seem simple and ordinary until you combine them with children, grandchildren or friends. Each one creates their own masterpieces with icing and sprinkles and colored sugars. The magic is in the love and fellowship and the memories you are making. I remember making them with my grandmother and have enjoyed passing the tradition to my own. What would be “bliss” is having you make these for me! They sound so yummy! Thanks for sharing. Enjoying the blog. Love your recipes and pictures! another Tennessean that went to Trevecca. Besides the run-of-the-mill sugar cookies, I love to make chocolate gingerbread men. Looks incredibly delectable! I’m making them soon! My favorite Christmas cookies are no bake cookies. I subscribed for your emails! Yay! I love the holidays and all the cookies that come with it. If I had to choose a favorite it would be ginger snaps. I just gave you a little shout out on f/b! My fav Christmas cookie is called Meltaways. 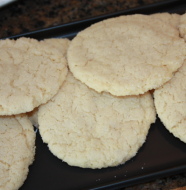 They’re like a Mexican Wedding Cake cookie and they are terribly unhealthy but fabulous. Rumor has it that when I was 2, we were flying to my grandparents’ house and I was asleep on my mom’s lap. She leaned over to my dad and whispered “Do you want some Meltaways?” and I immediately woke up and said “I want a Meltaway!”. I shared your post on FB! I am now following you on email! This recipe looks so delicious, I really really want to try this one! I have to admit, I have not made a lot of Christmas cookies myself, but I have eaten plenty! My mom and grandma were the great bakers of the family. Now that my mom lives in Florida, it might be time for me to take up the Christmas cookie tradition. My grandma made a ton of peanut butter balls at Christmas time, balls of peanut butter covered in chocolate. It’s likely a little bit more complicated than that, but those were my favorite! I also love Spritz cookies. I would love to make some of those this year. I subscribed for your posts via email! I also shared the post on Facebook. I subscribed to your email updates (I loved the peanut butter ice cream recipe!) and look forward to what you have to share. I’ve not found a favorite Christmas cookie since going corn and gluten free a few years ago, although Honey Cookies may fit the bill. I’m a big Alton Brown fan, though, and usually use his Sugar cookie recipe and once did Peppermint Pinwheel cookies. Lots of work, but very pretty and tasty too. Any cookie I don’t have to bake. Cookies are not really my specialty. Ok, I’m not sure I have a specialty, but cookies have never come out right for me! Now I’m on your email list, finally! Sounds delicious. I can’t wait for the recipe. I know I am late with this comment, and out of the drawing, but i still wanted to let you know how much I love your site and have shared it with many friends as well as linked it to my own blog! Way to go guys! LOVE the recipes and thoughts! !